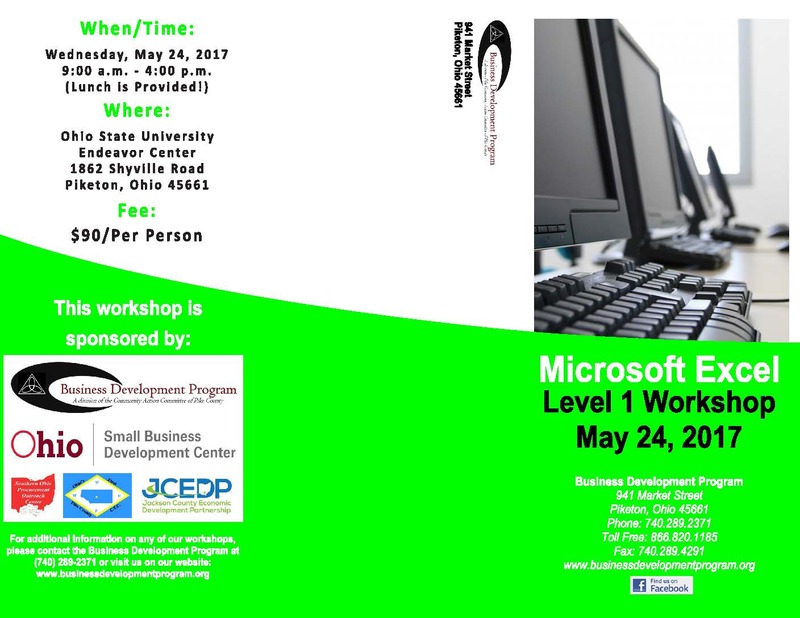 Microsoft Excel 2013 Level 1 Training Workshop Offered. 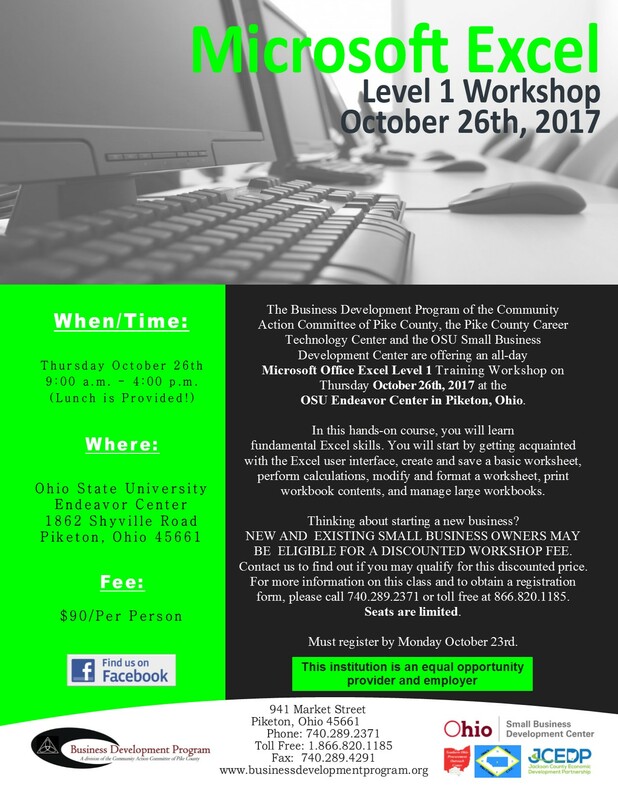 The Business Development Program of the Community Action Committee of Pike County, the Pike County Career Technology Center, and the OSU Small Business Development Center are offering an all-day Microsoft Office Excel 2013 Level 1 Training Workshop on Thursday October 26, 2017 from 9:00 a.m. until 4:00 p.m., at the OSU Endeavor Center in Piketon, Ohio. In this hands-on course, you will learn fundamental Excel 2013 skills. 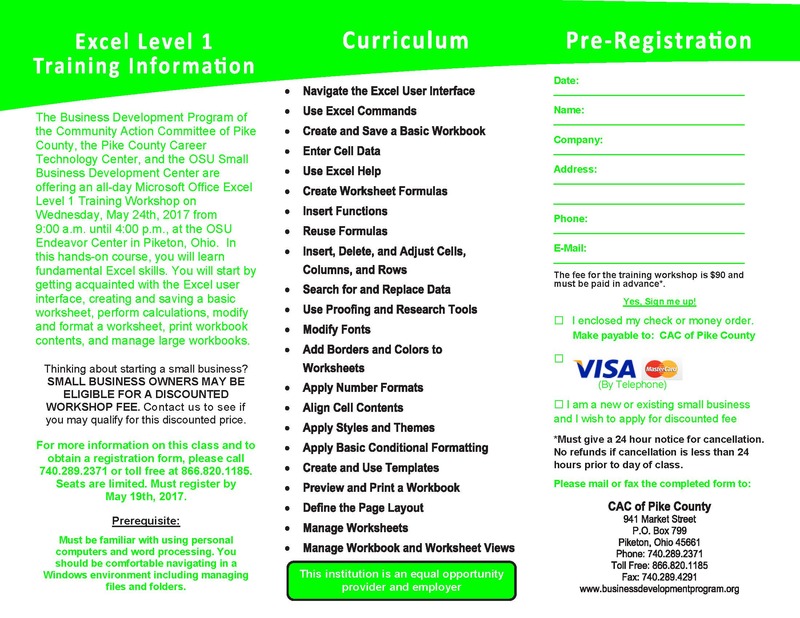 You will start by getting acquainted with the Excel user interface, creating and saving a basic worksheet, perform calculations, modify and format a worksheet, print workbook contents, and manage large workbooks. 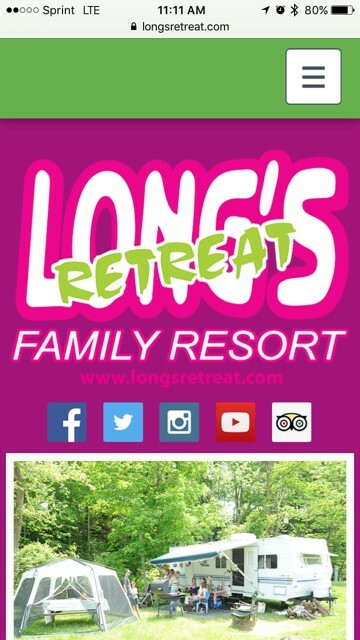 For more information, contact Lisa or Wendi at 740-289-2371 or toll free at 1-866-820-1185. •Address recipient(s) with professional formality. An introductory “Dear Mr. Smith,” for example, can have a big influence on how professional and courteous you seem. •Use clear and accurate subject lines. Include the required action, if possible. Effective subject lines also help you organize messages for future reference. Change subject lines and/or start a new e-mail thread if the conversation changes to a new topic. •Use standard grammar and spelling, and proofread. This is still a business document, so treat it accordingly. Avoid excessive exclamation points, abbreviations, emoticons, etc. Use complete words and sentences. •Control your tone. Read a message out loud, and assess whether there is any chance for misinterpretation—reword if necessary. •Include context in each e-mail, even if the e-mail is a continuation of another conversation. Giving a little context shows that you are being courteous by not assuming the receiver will automatically understand and remember the conversation. •Choose words carefully, because e-mail is forever. Remember that deleted e-mails can always be retrieved. Understand that an e-mail can be grounds for dismissal if it shows evidence of significantly inappropriate behavior. E-mail can also be used as evidence in legal matters. •Choose the appropriate “reply” setting. Think twice when using “Reply all,” for example, to determine whether all original recipients really need to be copied on the response. •Respond to e-mails in an appropriate amount of time. What is acceptable may vary by organization, person, and project. For example, some people or projects require immediate responses. Others may be fine with a response within 24 hours. •Use professional names for e-mail attachments. Use names that clearly identify what the attachment is. •Treat e-mails as the unsecure documents they are. E-mails are not private, so never use them for confidential or sensitive information, such as customer account numbers. •Don’t send an e-mail in anger. If typing your frustrations helps you to diffuse them, open a word processing document and do so, but then delete the document. Don’t open an e-mail message in which to vent because it could be too easy (or tempting) to send it inadvertently. •	Overview – if you don’t want to dive deep into your page, no worries. The overview showcases a summary of all the statistics and your most recent posts. •	People – Oh wow, this shares so much. If your business needs to target a specific audience, this is a great starting point. This tab shows the likes of your page and the people those likes represent. Percentages of male and female fans, age ranges, and the cities (and countries if relevant) they represent. •	Posts – This tab lists your published posts and how they were received. It shows the type of post – whether it’s a link shared, a photo uploaded, or just text; the reach or the unique number of individuals who have seen the post, and the engagement, which is clicks on the link or photo, reactions, comments and shares. •	Local – If your business page has an address associated on the page, then a Local tab will show up in your insights, which shares data from the zip code you are located in. There’s also statistics on videos, events, messages, and even more. The biggest key to all of these insights is one thing. POST! 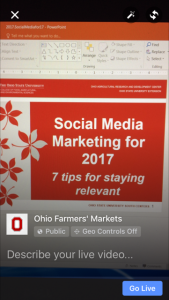 Too many businesses come to me with help gaining a larger audience with their Facebook page, but only post a few times a month. The more you post on a regular basis, specifically posts with links or videos, the more reach and engagement will grow on your page. 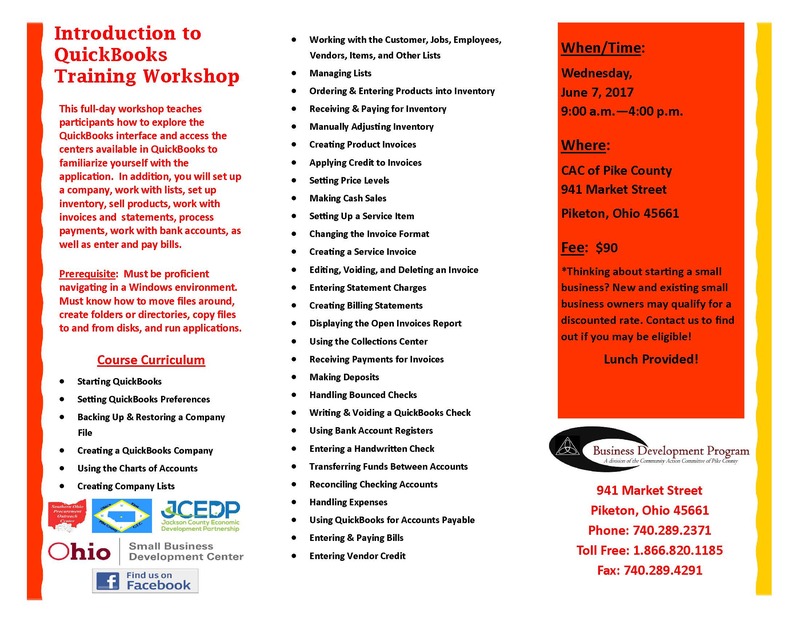 The Introduction to QuickBooks Training Workshop enables individuals and business owners to gain knowledge in the basics of QuickBooks. QuickBooks are easy-to-use computer accounting systems for small business. You will use the basic features of QuickBooks to record and track your business transactions. This course is designed for persons who have no prior knowledge of how to use QuickBooks, or for persons who are familiar with the software and want to learn about the new features and functionality of QuickBooks. Social media is ever-changing and evolving. First, all you had to do to gain views was post. Then, you needed to add pictures to a post. Now, video and livestreaming is increasingly popular. 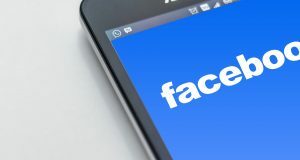 Pressing that Live button can be daunting on Facebook, but for a business, it’s a great way to provide a tour of your facility, new product launches, cooking demonstration, or just a way to answer questions from your followers. Facebook Live will save on your timeline for followers to watch whenever they can. Some helpful tips before you create a Facebook Live video for your business. 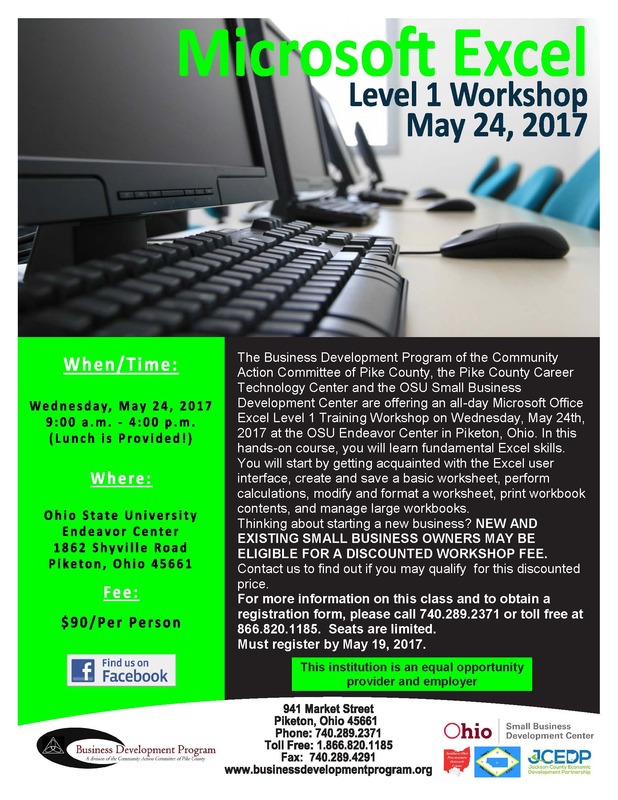 Seats are limited so register now for the May 24, 2017 Microsoft Excel Level 1 Workshop to be held at Ohio State University South Centers-Piketon! Is your website mobile friendly? What does she even mean, of course it pops up on my phone? The difference is, when a website pops up that is not mobile friendly, it’s not easy to read, you’ll have to zoom in a good bit to read or navigate the page. Like this example, a mobile friendly website fits on your screen with good size font and easy access to the information on the site. The little lines at the top? That’s the menu. But why is that important? Well, for starters, 80% of internet users have a smart phone. And the average time spent browsing on a smart phone was 87 hours per month! 67% of shoppers are more likely to buy from a website that is mobile compatible. (Smart Insights). Google has prioritized mobile-friendly websites in their algorithm, which helps your business tremendously in search rankings. Having a mobile friendly website also helps builds your brand’s credibility that you are a current and relevant business. So what’s your next steps? Grab your smartphone and pull up your website, how does it look? Log onto: https://testmysite.thinkwithgoogle.com/ and run a test on your site. Google will then email you a detailed report of how to fix the problems you have on the site. If it’s not mobile responsive, then it’s time to update your website!